“As I have grown older, there is a difference in my prayer and it has to do with the concept of knowing. Now, I have a different sense of knowing than I did when younger: I know God is not up there or out there but present within each of us. This sense of awareness is my essence of prayer,” explained Sister Ann Pitsenberger. Born at 6 p.m. on September 12, 1933 in Indianapolis, IN, she is the second child of three girls. She dreamed of one day becoming a wife and mother of lots of children. She did not aspire to have a career or go to college – just get married and have a big family. However, during high school “the scales started tipping” as she considered religious life. “A classmate and I would talk with our music teacher (a Sister of Providence) and discuss spiritual things. I began to attend daily Mass but for the longest time really did not have a clear idea of what the future held,” she said. “I felt that God was beginning to call me to this way of life but still was not completely sure,” she added. Her struggle brought her to the realization that she did not want to enter religious life as a Sister of Providence because, interestingly enough, she knew too many of the Sisters and thus she thought she would be entering for the wrong reason. There was a high school retreat that had a lasting effect. “Our retreat director was a Franciscan priest and I remember him saying that he knew there were religious vocations in our school. I then knew that I needed to talk with him about what I had been considering for my life,” she said. They had their conversation and it was in the quiet of the confessional. Sister Ann told Father Raymond she was considering religious life but only knew the Sisters of Providence and she did not want to be a teacher. Not knowing what work she wanted to do, she said she wanted to take care of children and the elderly. So the priest gave her the names of two religious communities. Without a pencil or pen to write the names down, Sister Ann tried to remember the names as she left the confessional. She only remembered one. “I wrote to the Hospital Sisters, answered their invitation to visit and entered a month later. It felt right for me even though I had never considered nursing. All I wanted to do as a Sister was scrub floors so I could spend my life in prayer,” she said. “When God calls, he does not fool around – he’s pretty clear – and he was very clear with me and I responded. This was never a question of whether I was doing the right thing. I knew it because God was clear in his call,” Sister Ann said. Sister Ann entered religious life on March 30, 1950 and made her First Profession on October 4, 1952. After graduating in 1957 from St. John’s School of Nursing, she served as a recovery room nurse for three months at St. Joseph’s Hospital (Highland). She then earned a Bachelor of Science degree in medical records library science from St. Louis University and served as the supervisor of medical records at St. Mary’s Hospital (Decatur) from 1961-1965. After earning an MBA in business and hospital administration from Xavier University and completing a residency in hospital administration from Mercy Hospital (Denver), she served as the assistant administrator at St. John’s Hospital (Springfield) from 1968-69. It seemed that administration was where she would continue to serve: St. Francis Hospital (Litchfield) from 1968-72; St. John’s Hospital from 1972-75; St. Mary’s Hospital (Decatur) from 1978-84; and again as the EVP of St. John’s Hospital from 1984-90. She also earned the title of Fellow, American College of Healthcare Executives. “During the most recent time at St. John’s, I realized the most important thing a leader can do is bring hope to the people. When we work together with hope, we can make a difference. Hope brings life and energy to an organization,” she said. 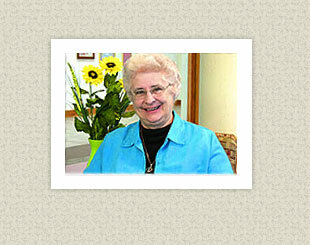 From 1988-95, Sister Ann was elected to serve as a Provincial Councilor of the American Province. She was then elected to serve as the Provincial Vicaress from 1999-2007. Currently, she volunteers at Hospital Sisters Mission Outreach with fund raising efforts and also serves on the Board of the Pregnancy Care Center in Springfield. “My life has been good and blest in so many ways. My religious Community has given me much–an education and many opportunities to serve-and I have enjoyed it all. I am still enjoying it,” she said.